By David L. Cram, M.D. The traditional doctor-patient relationship is in jeopardy. In an era of “hurry up” medicine and “patient quotas,” health care professionals are often no longer able to apply good bedside manner—the healing touch. As the focus shifts from patients to profits, this vital component of patient care diminishes and may eventually be lost. 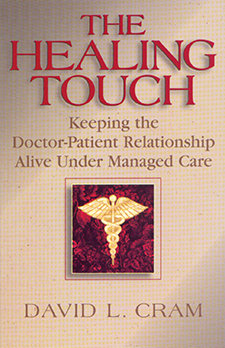 How does the quality of the doctor-patient relationship influence healing? What are the cardinal rules of good bedside manner? What are the qualities of a good doctor? What do patients expect from physicians and nurses? Which techniques put patients at ease? What role do doctors and nurses play in caring for dying patients? How can health care professionals preserve the quality of medicine they practice?